The Durandal Spectrum is a very solid keyboard, with some nice options and steady overall performance that provides some nice flexibility due to its design as well. At a glance, the Durandal Spectrum is a nice-looking keyboard. It has a hefty weight to it, giving the impression that it is solidly built. With a numeric pad on the right, it is a full keyboard that comes with everything you would expect. You can order it with a variety of switches, and mine is of the blue cherry MX variety, which happens to be my preference due to its tactile physical and audio feedback. Being a spectrum model, you can expect that this Durandal is very colourful, touting over 16 million different lighting options. There are seven different lighting effects, and each key can be programmed to have its own colour if you really wish to go that far down the rabbit hole. Not only can the keys be coloured however you like, but each one can be fully programmed as well using the software. I will say that the included software is not my absolute favourite. It's easy enough to use, but the core system seems about the same now as it has a few years ago, and the interface is not ideal for some of the functions, such as assigning individual key colours. However, the keyboard itself looks great. 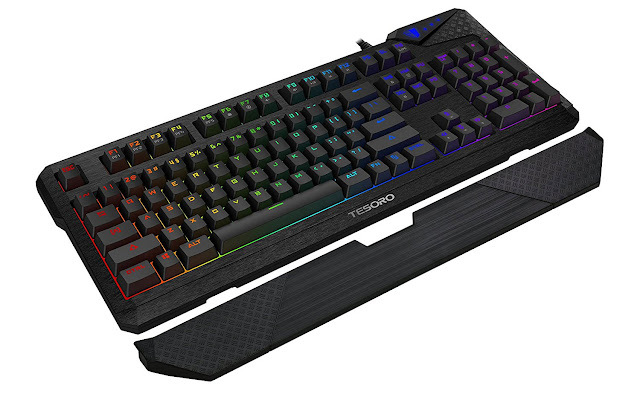 It is a black keyboard which allows the laser cut backlit key caps to really pop - especially if you are already playing in a somewhat dark room. On top of that, there is a palm rest that comes with it. I have mixed feelings about the rest, which is not the most comfortable I have ever used, but it is not bad. Thankfully, if it is not to your liking, it is easily detachable, which is a nice touch. As for the keys themselves, much like the keyboard, they feel fantastic when typing. They do not ghost, they respond instantly and they held up to some pretty rigorous use on my part. Any time I get a new keyboard to try out, I use it exclusively for the week. One week of typing from me can put a keyboard into the hundreds of thousands of words, so it gets a pretty solid workout. After typing/abusing the keyboard in this fashion for about a week, I can say that there were no issues with them. Each and every one still presses accurate, and still provides excellent tactile feedback. The one thing I did see every now and then while testing this keyboard is that if you have an incomplete key stroke, you might wind up creating a 'double tap' effect. This hardly ever happened to me, but there were just a handful of times over my week of heavy use. If this or any other durability concern comes up further down the road, I will be sure to update the review accordingly. For players, rest assure that there are some nice features in the keyboard. I touched on the programmable keys, and there is an on-the-fly macro creation option built-in as well. Easy to use, but handy for those who want to truncate a series of keystrokes into one press. There is a 3.5mm headphone jack as well as a pair of USB pass-through ports. I actually found these features quite handy as I tend to sit back a bit from my PC (I tend to operate out of my recliner and have very large monitors), so instead of having multiple cables draped across that distance, I can simply daisy chain them through the Durandal Spectrum. Across the board I consider the Durandal Spectrum to be a solid offering. It looks great, and it has a few handy quality of life features worth taking note of. Considering that it rings in at about one hundred and fifty dollars, you get excellent performance and a nice host of options at a lower price than a lot of the other competitors I have tried out. The software could use some updating in my opinion, and the wrist rest is an extra feature I could take or leave, but it is nice that it can be detached. 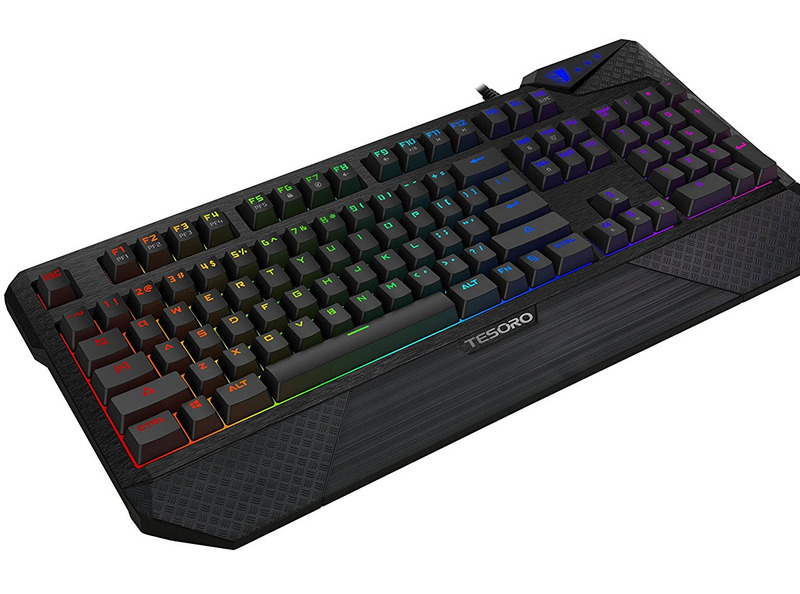 Really good at just about everything, the Durandal Spectrum might not have that one revolutionary feature that blows you away, but it is a great option whether you want to use it for gaming or just lots of typing.